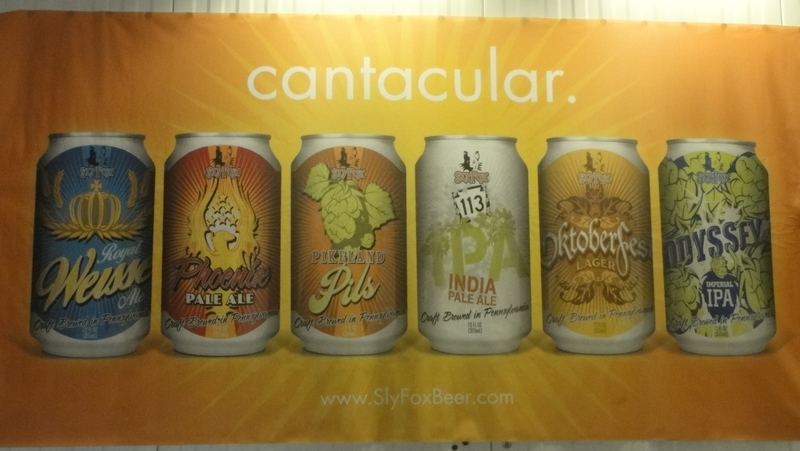 On the morning of 4/2/14 we said goodbye to Philadelphia and, accompanied by plenty more rain, made our way into central Pennsylvania to tour Sly Fox Brewing Company’s new production facility in Pottstown. 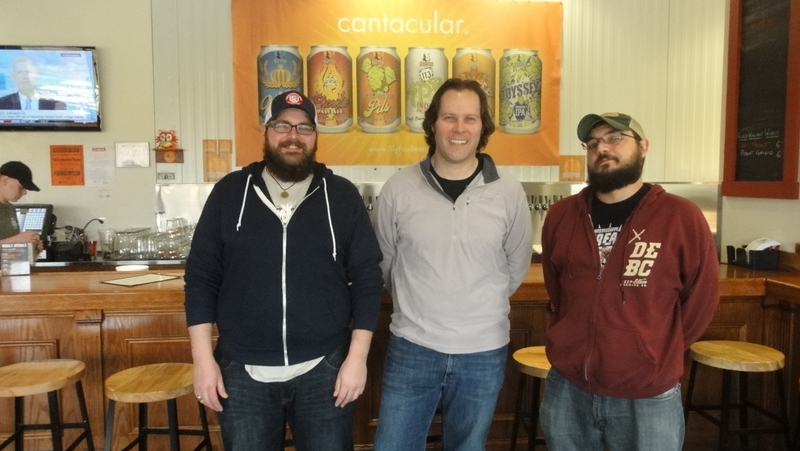 We got there as the taproom opened at 11 am and were thankful to meet with Director of Sales, Patrick Mullin. 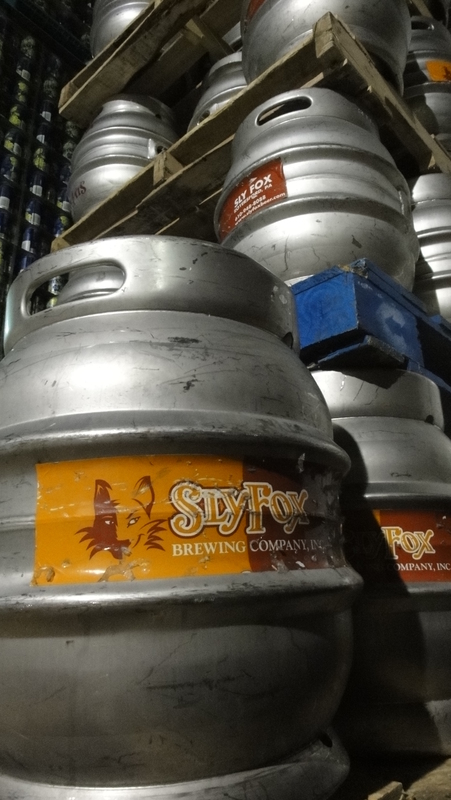 The name, Sly Fox, actually comes from a still existing tradition of fox hunting in the surrounding Chester County area and in that vein of locality, many of the beer names are based on local landmarks. 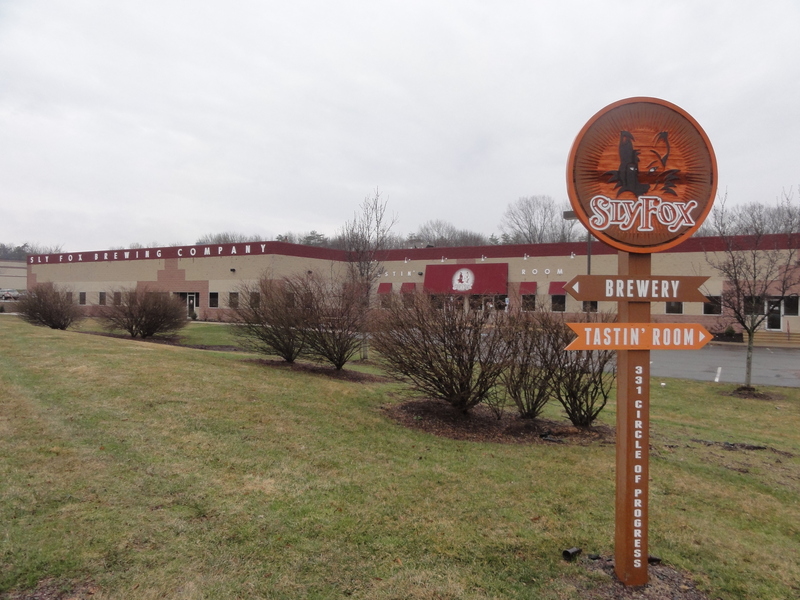 The original brewpub location, Sly Fox Brewhouse & Eatery, was opened by Peter Giannopoulos in nearby Phoenixville in late 1995 and the Giannopoulos family still owns the brewery to date. 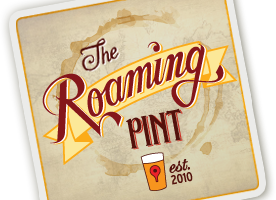 In 2004, they opened up a 20 bbl production facility in Royersford in order to keep up with increased demand, however, growth was steady and by 2011 the restaurant was sold to former employees to make way for a larger operation in Pottstown which came online in 2012. The new Pottstown location that we visited is 30,000 sq. ft. and houses a 50 hectoliter brewery. Two new 150 hectoliter fermenters arrived just prior to our visit putting the brewery up to a total of 7 with additional room to expand. Currently the brewhouse is two vessel but space has been left to add additional vessels and improve efficiency. 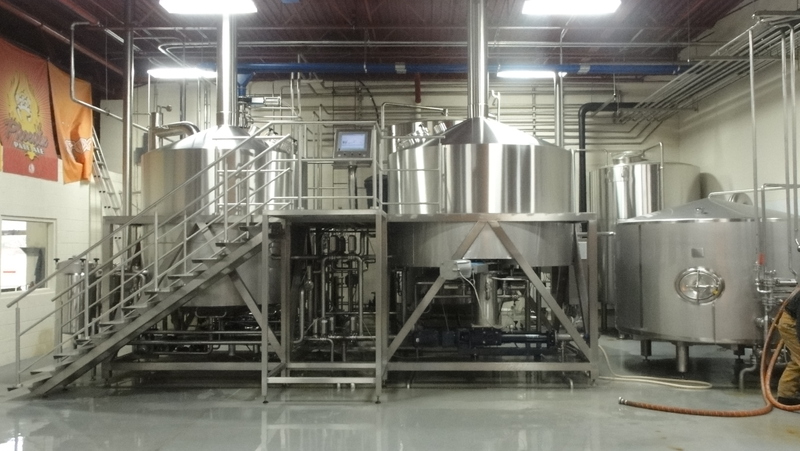 The brewhouse is also quite technologically impressive for a brewery of this size as it can be preprogrammed and set to a timer in order to draw in and weigh grains, mill, and start the brewing process automatically. Any issues will send an alert to an authenticated cellular device and can be addressed accordingly. 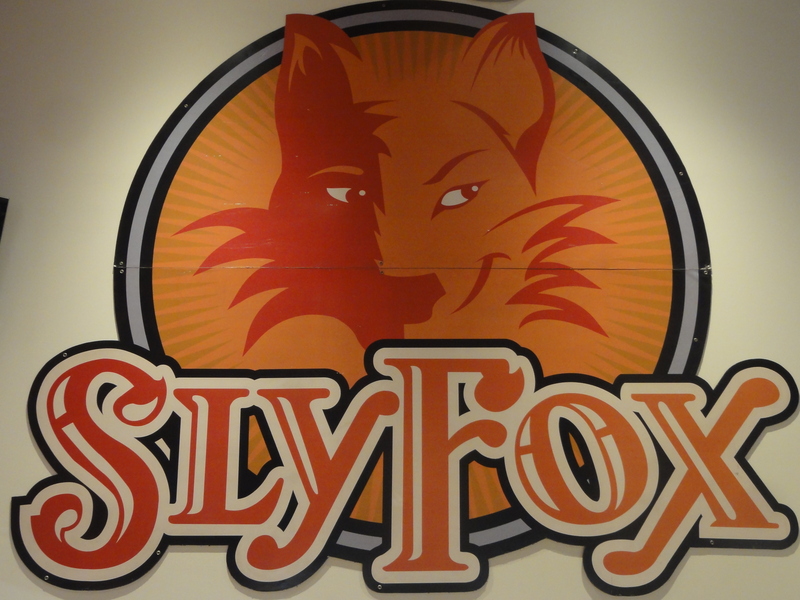 Production volume at Sly Fox in 2012 was 12,000 bbl and last year they made the jump from micro brewery to regional brewery when production reached 16,000 bbl. Patrick explained that the brewery has been experiencing slow and steady growth around 25-30% for nearly the last decade. Sly Fox also serves as a contract brewer for the central line-up of one of our previous stops, The Brewer’s Art in Baltimore, and they have recently begun production for Mikkeller’s canned offerings. In 2006, Sly Fox Brewing Co. became the first brewery in the mid-Atlantic and one of the first in the nation to offer craft beer in cans. 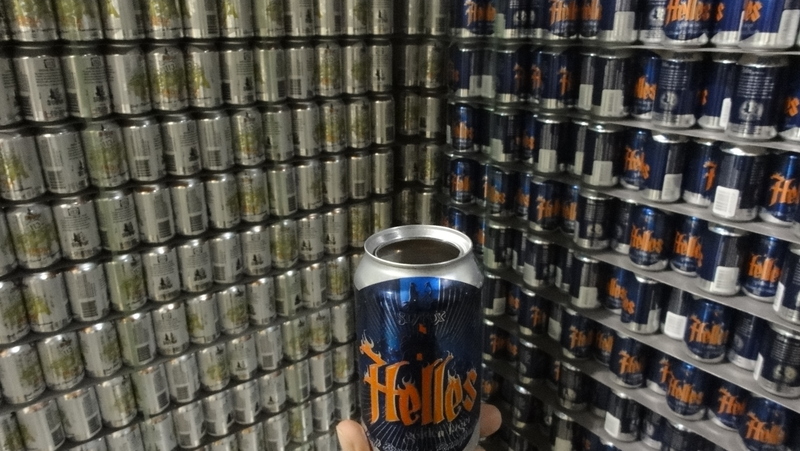 Additionally, in March of last year they were the very first craft brewery to launch the 360 can design for the Helles, a can with lids that peel completely off leaving an open drinking vessel like a cup. Of note, keep an eye out for the release of an IPA in 16oz 360 format. Unfortunately, those cans, which deliver the full aroma of the beer without having to pour it into a glass, are only available in the state of PA. 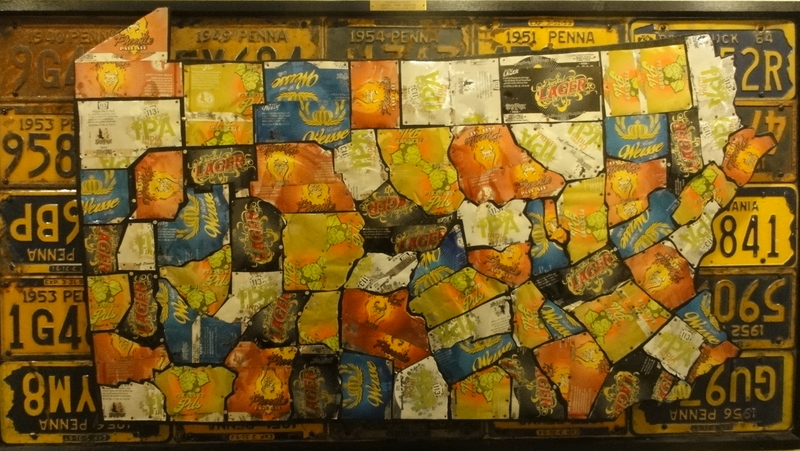 The brewery also currently distributes to NJ, NY, DE, MD, VA and DC, however, many of the other states do not allow those cans, citing concern for litter from the peeled off lid. The MD and VA markets were opened at the end of last year and all expansion goals will be aimed at filling out current markets. Highly decorated Brewmaster, Brian O’Reilly, has been with the company since 2002 and has overseen many stages of growth and innovation. Sly Fox is not into crazy, over the top beer styles; Brian prefers to make beers that consumers will wish to drink again and again. In fact, they are just now doing their first barrel aged beer – a Russian Imperial Stout called Nihilist is being aged in Heaven Hill and 4 Roses bourbon barrels. The brewery offers four beers year-round in both kegs and cans: Pikeland Pils, Helles Golden Lager, Phoenix Pale Ale, and 113 IPA. Additionally, O’Reilly’s stout can be found year round in keg only and, quite unique in our experience, Chester County Bitter is a year round offering only available as a cask conditioned ale. Brian and the rest of the brewing team also produce a line-up of four Belgian beers that see year round distribution as cork and caged bottles with limited availability in kegs. That Belgian line is made up of Saison VOS, Incubus Abbey-style Tripel, Ichor Abbey-style Quaddrupel, and Black Raspberry Reserve wheat ale. The established seasonal line rotates through five different beers throughout the year available in both cans and kegs. Odyssey Imperial IPA starts off the year with release in Jan-Feb, followed by Royal Weisse Ale in spring (actually year round in keg only). In Summer, Grissette Working Class Ale hits stores (entering the canned rotation for the first time this year) and is replaced by Oktoberfest Aug-Oct. The last canned seasonal of the year is Sly Fox’s Christmas Ale in Nov-Dec which is also provided in 750mL bottle format. An additional selection available seasonally is Seamus’ Irish Red Ale and, though not canned, is offered in kegs Feb-March. The brewpub is also busy churning out small batches and cask beers, a few of which can often be found on tap at the production facility. 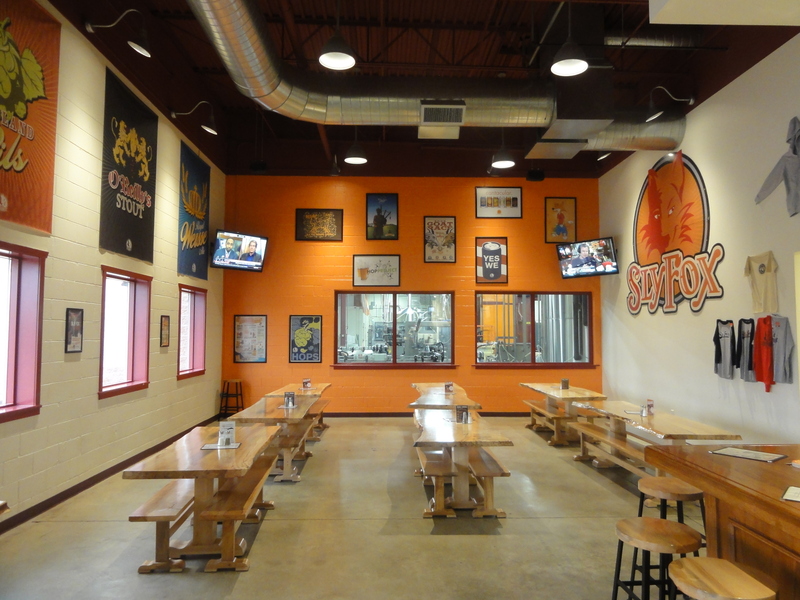 Over 100 different beers have been released since Sly Fox opened for business. In terms of special events, Sly Fox clearly knows how to throw a party. The Phoenixville location plays host to their annual Bock Fest on the first Sunday of May, which is notorious in the region over the past 10 years. During the event, thousands gather to watch a goat race where the owners can run with their goat but it has to cross the finish line before the handler. In 2011 Peggy, a 3-legged goat, beat out 58 other goats to take first prize. She repeated the following year but lost the next year to her son, Simon, who just so happens to also be operating on 3 legs. Of course, this being a brewery event, the race is accompanied with plenty of German fare and fresh local beers – in this case the brewery offers up a variety of bocks from which to sample including Slacker Bock, Helles Bock, Instigator Doppelbock and a couple Eisbocks. Following the race is the official release of the Maibock which is named after the race’s winning goat. The brewpub also hosts an anniversary party each 2nd Friday of December with live music and this year will mark the 19th anniversary. Typically, a special beer is brewed by Brian to commemorate the occasion and is tapped alongside plenty other beers that were available during the previous year. 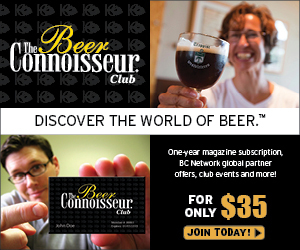 Last year the celebration delivered 36 different beers on tap. In addition, this year will mark their 4th rendition of Kan Jam tournament where last year over 100 teams participated. Today, May 17th, they hosted the first Taps, Tunes, and Trucks event at their tasting room in Pottstown. Live music, the promise of grub from several food trucks, and the official release of the Grissette served as inspiration for runners of the FoxTrot 5K. 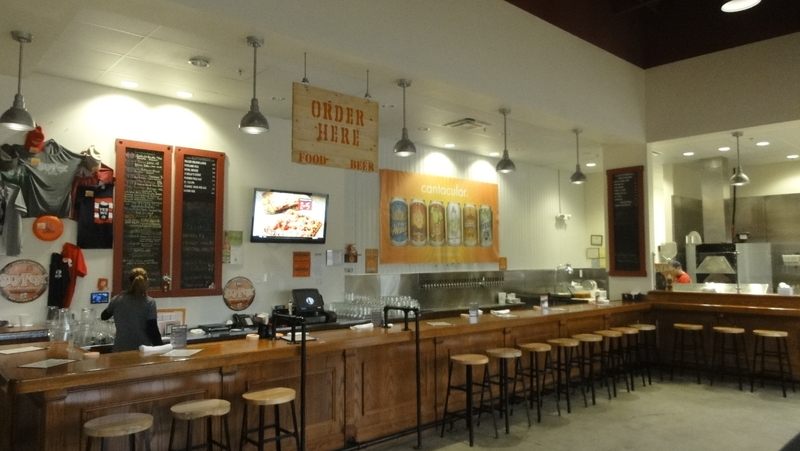 Both Sly Fox locations provide patrons with tasty food options and offer broad hours of operation. Each location also offers a variety of food and drink specials. 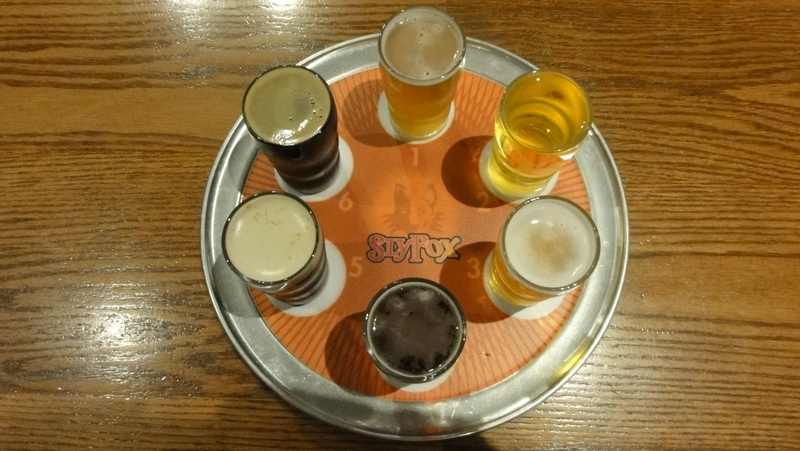 We encourage those visiting Pennsylvania to check out one of the Sly Fox facilities for a bite to eat and good beer, or book a trip in time to watch a most certainly entertaining goat race for Bock Fest. 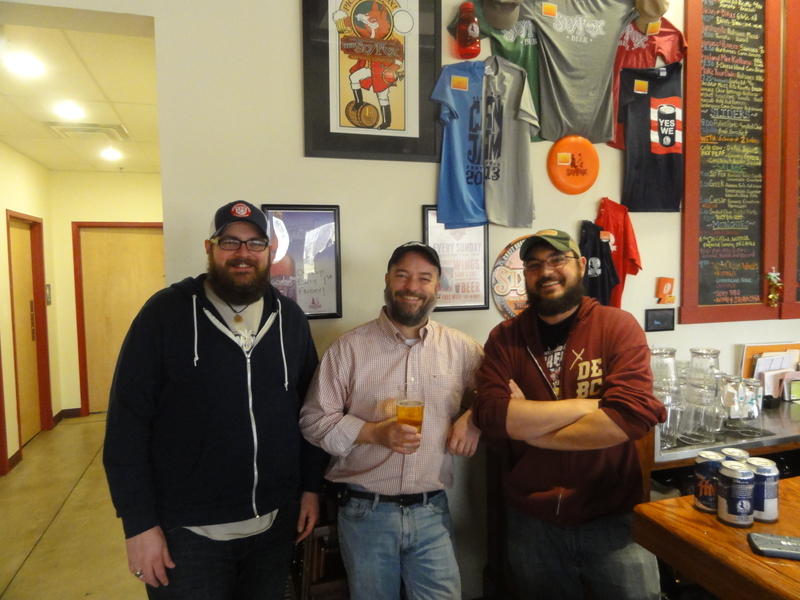 We really want to thank Patrick for agreeing to meet with us and for sharing his obvious passion for Sly Fox beer as well as Brian for stopping by to say hello.